First, the vacation part. Our youngest son and his family will be arriving tonight for a week. These are our littlest grandchildren, ages 5 and 2. I’m excited about spending time with them, and know it will be non-stop fun. I’m sure there will be some art activity when it’s too hot outside to do anything else, and we will share, I promise. In future posts I will be showing each of the individual paintings that were recently completed and sent to the gallery in Tampa. They were shown previously in groupings, but I have good photographs of each one. I like to keep good photo records of my work. Therefore, I make sure each one is photographed in high resolution with good lighting. For most artworks, the best lighting is outside. But because many of my paintings are high gloss, I often shoot them indoors, or outside in the shade, which entails some color adjustment. If possible, I will just try them on the scanner (if they are small enough, which these were.) I have a very good scanner which does the job well for most works. But if they have a lot of texture, the scanner sometimes isn’t able to pick up the dimension well. For those, I need outside lighting or good lamps for an indoor shot. The bottom line is that each individual painting has its own lighting and imaging requirements. 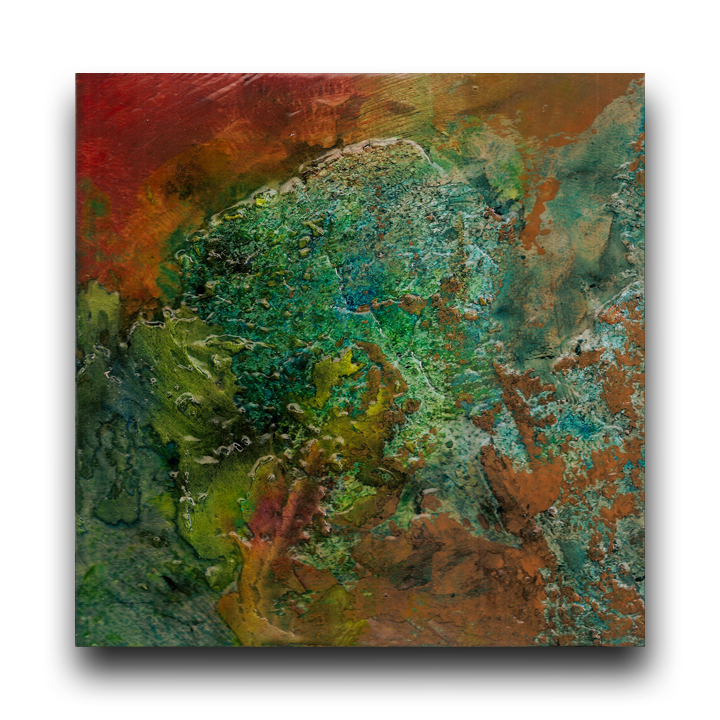 Here is one of the pieces that presented me with the challenge of picking up the color and depth of texture. I wasn’t satisfied with the original scan, so I took it outside and tried it in the bright mid-morning light. I was surprised to find that the scan was the best choice. After adjusting the color just a little bit, I was finally happy with it. This painting is available at Michael Murphy Gallery in Tampa, Florida. Have a great weekend and I’ll check back in soon. Great texture!….I agree, the hardest thing to photograph. Love the colours and textures in this one. Have a wonderful time with your grandchildren. Yes, Karin Lynn! I put the art piece right on the scanner if I can get away with it. That means they have to be small enough to fit on the scanner. I do most of my collages that way. For the rest of my art I use a “proper” camera – a wonderful Canon Rebel DLSR camera. Good photographs are so important. Here’s a good basic video on the subject. Check it out and let me know if it answers most of your questions. I do have a post about photographing your art. Here is that link. Let me know if you have further thoughts or questions and we can talk about them. Good luck! inspiring colors and texture – took me right into a fantastical forest – eerie and beautiful.